It’s been on my mind after talking to many of you about “social media” which has taken over our modern lives. I am aware social media is not for everyone and shouldn’t be the only platform for sharing, and so I would like to create ‘weekly catchups’ on my blog. I love posting a picture of something I’m working on, cutting up, finishing or new items in the shop. To me, it’s a quick easy two minute job popping a picture on Instagram and Facebook but I realise not everyone sees that. So I’m thinking if I recap the highlights of the week and show you what’s going on at the shop and projects in progress , then more of you can join in and feel included?? Bare with me though as I am not a writer. I had great advice recently from someone who is and he suggested I write in my own voice. So I’m imagining we are stood chatting in the shop, shooting the breeze! So what’s new this week? Well I wrote a “blog” which I’ve put off since Christmas and it’s basically a list of bullet points I needed to share. It was a struggle but I got most of it down. Hence I felt guilty and think this will be more engaging. I’ve been stitching away on the County Claire pattern by the talented Judy Newman who I can’t wait to meet in a few weeks in Nantes at the Pour L’Amour Du Fil a Quilt Show for all things quilting and this year it is celebrating Australia! 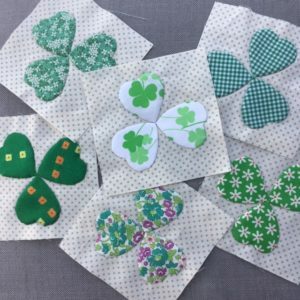 I am collecting patterns, templates and lots and lots of goodies for the shop. Susan Smith is running two workshops in early April, teaching her Fleur quilt, another talented Australian. Her Applique work is very special and you must take a look at her new book we are selling in the shop. Every project is devine I promise. So that is very exciting. Did I mention Valdani threads? 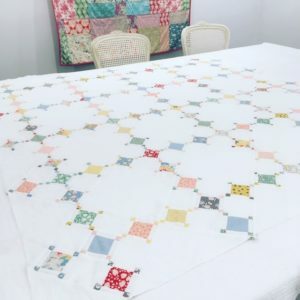 These are glorious and so lovely to quilt with and I’m excited to catch up with Stephanie and Lindsay who are the main distributors who I met last year at Festival Of Quilts they will be at Nantes. So, I’ve digressed. Yes Nantes is soon but I’ve got lots of sewing projects and ideas ready to get going on. County Claire is made up of 2 different blocks (40 of each) and actually pretty quick to piece together. I try and prep a few at a time so in the evening while listening to the TV or chatting with family I can stitch them together. They also fold easily into my tiny tin so they travel about with me ready to go. I’ve just basted the white linen quilt which I machined together a month ago. I glued it first time round but travelling in and out of the shop a few times it started to look awful and I discussed it with Carolyn Forster who encouraged me to correct it and baste every inch of it to hold it well. Success! After a day bent over my kitchen table listening to Roxy Music it was done and already looks better. So I can now concentrate on the quilting design and begin. My “workshop” sign just needs binding, then it can go up in the shop. 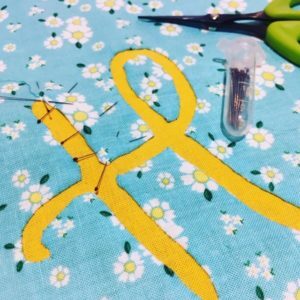 I have become obsessed lately with Reverse Applique after joining Tracy Aplin in her workshop. Just the pinning and turning makes my heart skip, it’s wonderful. I’ve also almost finished the “Happy Easter” hanging too. 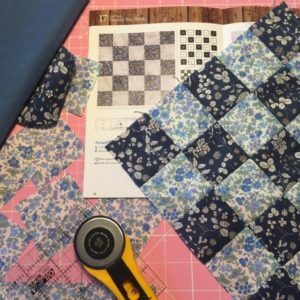 Not sure if it needs quilting? I’ll post a picture next week to show you. My secret sewing project, that I cannot share on social media until July 28th is coming along really well. Very happy to show anyone in the shop what it actually is! It’s different and using new skills and fabrics like I haven’t used before. Very excited about it. My 36 block quilt has progressed well. I managed to squeeze myself into Carolyn’s workshop and we are half way through. I am trying really hard to be accurate and get lovely crisp points and corners. Not my usual wobbly curves that I love. I’m using a single colour palette and picked the Oakshott Blues called Lakes. Ok, there might be a hint of purple/violet in there. It’s been joyous to work on. 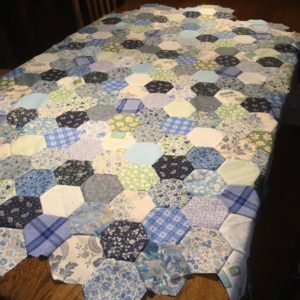 The large Hexie blue and green quilt is coming along too. I’ve just got to cut a big batch of Hexies because I’ve run out, then I’m ready to get on. I can almost do this quilt with my eyes closed, its a dream to stitch and its American pieced so its very quick. Ok, that’s enough of my schedule! Thank you for reading. I look forward to seeing you in the shop, taking a peek at your work, helping if I can and filling the day with happiness. * Next week we have The Handmade Quilt (session 5?) 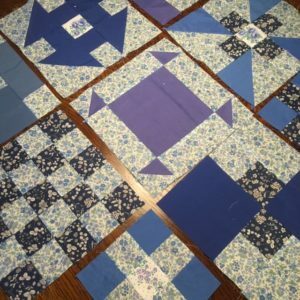 in the workshop with Carolyn on Thursday, Maggie is teaching and making the Easter Bag on Friday and Saturday is the 36 Block Quilt with Carolyn again. 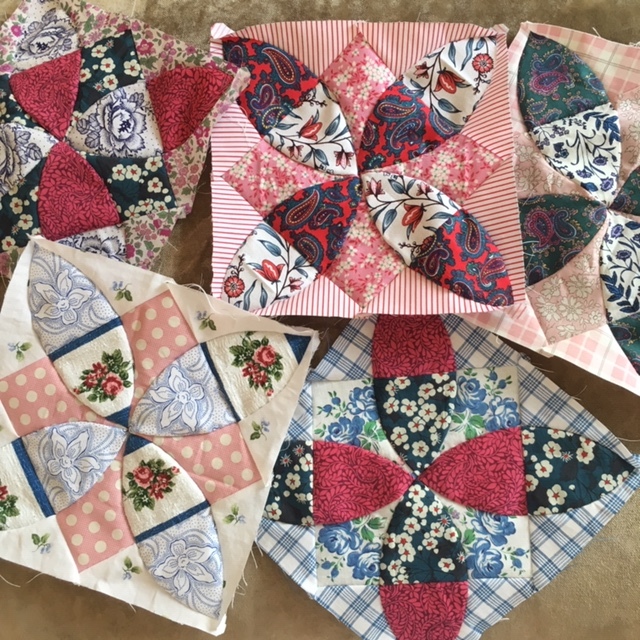 Free Demo Days for the Today’s Quilter block by Carolyn Forster are Thursday 18th April, Thursday 23rd May and Thursday 20th June.